China announced wide-sweeping changes to its import and export tariffs over the Christmas break; Australia-based expert China-watchers are divided as to Beijing’s motivations and what it might mean for Australia. Photo: Shutterstock. China’s Christmas announcement that it would introduce a round of tariff reductions on Chinese imports and exports has caused a stir in the community of China watchers. And that’s especially so given the background of tension in China-U.S. trade relations. China’s formal legal instrument putting a wide range tariff changes into effect was released a few days ago although the changes were flagged by China’s Ministry of Finance just before Christmas. Beijing declared that it would change import tariffs on over 700 lines of goods. The aim of the changes is to promote the Chinese economy and grow its import and export trade, according to the Ministry of Finance. Tax rates on 94 exports from China will also be abolished, the statement added. Then, on Christmas Eve, China’s national Customs Department elaborated on the tariff move. Zero rates are now in effect on miscellaneous items, as well as some pharmaceutical materials. Rates were cancelled on the import of different kinds of solid wastes, such as manganese slag. Provisional tax rates for the import of lithium ion cells, thionyl chloride and new energy vehicles were also cancelled. Lower import tax rates are applied on advanced equipment such as aviation engines and welding robots for automobile production lines. Export duties on 94 items such as chemical fertilizers, apatites, iron ore, slag, coal tar, wood pulp and various other materials have been cancelled in order to promote reform of the national export management system and efficiency improvement in the energy resources industry. The tax rates on eight commodities, including wheat, will be unchanged; tariff rates for urea, compound fertilizer and ammonium hydrogen phosphate will be subject to a 1% import tax rate. A sliding tax on the import of cotton will continue. To support the construction of the “Belt and Road” initiative, tax rates will be implemented on goods originating in 23 countries/regions, including Australia, the Customs Department explained. Meanwhile, there are preferential rates for Bangladesh and Laos under the Asia-Pacific Trade Agreement. Reductions in tariffs on 298 information technology products are due to take place beginning July 1. The Customs Department said these adjustments are meant to help China make “full use of domestic and international markets and resources. [They are] conducive to the overall coordination of the balanced development of relevant domestic industries and [are] conducive to promoting open cooperation, sharing development results and promoting the steady growth of China’s foreign trade”. Regular readers of FreightWaves will be well aware that there has been considerable tension in the Beijing-Washington relationship ever since President Trump was sworn into office. Washington unveiled 25 percent tariffs on a list of Chinese products in April 2018 and, of course, China immediately retaliated with a similar list of tariffs. Both sides then agreed to substantially reduce the trade deficit between the two. In early December, President Trump and President Xi announced a 90-day ceasefire on implementing tariffs and China agreed to buy a variety of goods from the U.S. to reduce the trade imbalance. Now there is a report of a forthcoming trip of a U.S. trade team to China. However, the interpretation of Beijing’s motives diverges among professional China-watchers. Other commentators have different views. Dr. Yixiao Zhou is a Lecturer of Economics at the Curtin Business School in Perth, Western Australia. She recently returned from a research trip to China. In her view, there are two main reasons for the most recent round of tariff reforms. Firstly, they are in line with President Xi Jinping’s stated aim of opening up the Chinese economy. And, secondly, the tariff cuts reflect the current economic and development needs of China. “The tariff cuts are mostly on imports. This is consistent with the first of the two visions and the first of the five policy proposals [that] President Xi provided in the speech – ‘it is important for all countries to open wider and expand the space for mutually beneficial cooperation,’ and ‘to broaden its opening-up, China will step up efforts [by stimulating] the potential for increased imports’. Tariff cuts on the export side could be viewed as support for exports and the competitiveness of Chinese firms in the world market. Tariff cuts on the import side are more clearly a signal of deepening market access and opening up the Chinese market. Hans Hendrischke is the Professor of Chinese Business and Management at the University of Sydney Business School. He has a different view on China’s motivations. China is a critically important trade partner for Australia. China accounts for A$174,451 million (US$120,846 million) total merchandise trade with Australia – that’s 28.2 percent of all Australian trade. 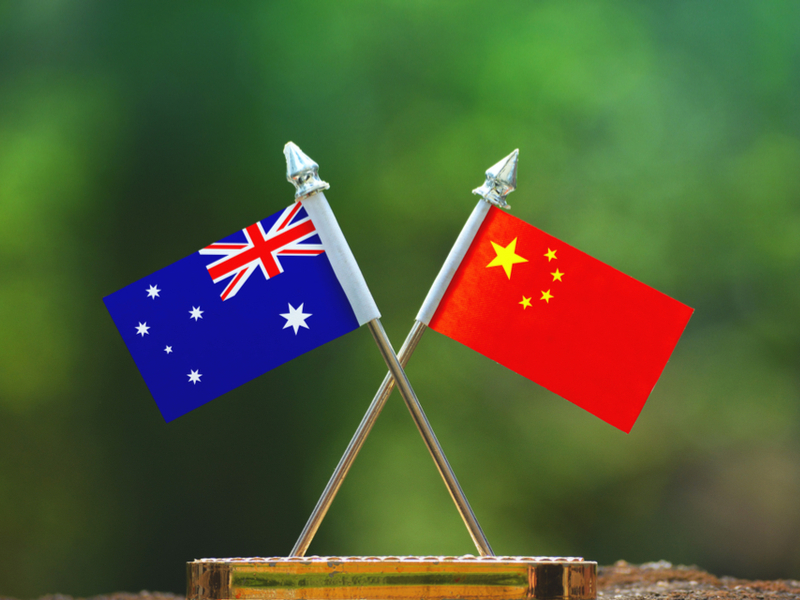 China is the biggest destination market for Australian exports at A$106,330 million. China is also the biggest supplier of imports to Australia with a total value of A$68,121 million. Commentators have mixed views on what the future U.S./China trading environment might mean for Australia. Dr. Zhou notes that Australia’s free trade agreement with China is due to be fully implemented this year, which is favorable for bilateral trade between Australia and China. But there are downside risks. “If China's economic growth slows down and global trade contracts, Australia will be faced with headwinds in exports of some resource goods that are important raw materials of production,” she commented. Professor Hendrischke foresees that some sectors, particularly agri-sectors, will be more trade-exposed than the major dry bulks.